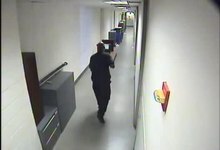 CCTV footage of the shooter in building 197 holding a Remington 870 shotgun. NAVSEA Building 197, Washington Navy Yard, Washington, D.C., U.S. The Washington Navy Yard shooting occurred on September 16, 2013, when a lone gunman, 34-year-old Aaron Alexis, fatally shot 12 people and injured three others in a mass shooting at the headquarters of the Naval Sea Systems Command (NAVSEA) inside the Washington Navy Yard in Southeast Washington, D.C. The attack, which took place in the Navy Yard's Building 197, began around 8:16 a.m. EDT and ended when Alexis was killed by police around 9:25 a.m. EDT. It was the second-deadliest mass murder on a U.S. military base, behind only the 2009 Fort Hood shooting. Pentagon Channel report on the event. On Monday, September 16, Alexis left his hotel and arrived at the Navy Yard in a rented Toyota Prius at around 7:53 a.m., using a valid pass to enter the Yard. He entered Building 197 at 8:08 a.m. through the main entrance, carrying the disassembled shotgun (the barrel and stock of which had been sawed off) in a bag on his shoulder, and went to the fourth floor, where he had conducted work during the prior week. He assembled the shotgun inside a bathroom, then emerged with the gun, crossed a hallway into the building's 4 West area, which is a cubicle area near the atrium, and began shooting at 8:16 a.m. Four people were hit; three of them died, while the fourth, a young woman, survived wounds to the head and hand. At 8:17 a.m., approximately one minute and 30 seconds after the first shots were fired, the first calls to 9-1-1 were made. By 8:20 a.m., Alexis had shot and killed eight people on the fourth floor, and he made his way to the third floor, where he fatally shot two more people within the next two minutes. He also fired at several people on at least five separate occasions, wounding one woman in the shoulder as she ran up a stairwell. A NAVSEA employee described encountering a gunman wearing all-blue clothing in a third-floor hallway, saying, "He just turned and started firing." After firing several shots on the third floor, Alexis went to the first floor. At 8:23 a.m., officers from the D.C. Metropolitan Police Department and several other law enforcement agencies began arriving at Building 197. However, because there were many buildings on the base, officers were unable to discern Building 197's location and asked bystanders for its location. They eventually found Building 197 after moving towards the direction people were fleeing from. There was also confusion regarding the shooting also taking place in a nearby building; in reality, a wounded victim evacuated from Building 197 had been moved to an area located near the second building for medical attention. The United States Capitol Police became embroiled in a public controversy when the police union accused the agency of ordering its personnel to stand down and not respond to the shooting. While on the first floor, the shooter moved around randomly before turning around and heading towards the front entrance. There, he shot and killed Richard Ridgell, the security officer stationed there, through a set of windows, and took his Beretta 92FS 9mm semiautomatic pistol afterwards. Ridgell, a former Maryland state trooper, had earlier been informed by two police officers to remain at his post and try to stop the gunman if he attempted to leave the building. The shooter then fired his shotgun at a second security guard and a Navy military police officer at the first-floor atrium, missing both; the security guard fired back and the shooter fled down a hallway. Shortly afterwards, the shooter fired at two police officers and a Naval Criminal Investigative Service agent in another hallway before fleeing again. At 8:34 a.m., the shooter went towards the west side of the building, where he encountered two men standing at a corner of the building in an alleyway. He tried to fire at them with his shotgun, but realized he was out of ammunition and switched to the stolen Beretta, shooting and killing one of the men with it; the other man managed to escape without injury. Reports indicated the victim in the alleyway was hit by a "stray bullet". The shooter's use of the pistol during the alleyway shooting led police officials to initially believe the possibility of a second gunman involved. After killing his final victim, the shooter moved to a cubicle area, where he discarded the shotgun. At the same time, a team of officers entered Building 197, but they became confused after gunshots echoed through the atrium, leading them to believe the gunman was on an upper floor. As a result, the officers headed up to the second floor, while the shooter remained on the first floor. At approximately 8:55 a.m., the shooter went to the third floor via stairwell and concealed himself inside a bank of cubicles. At 9:12 a.m., two officers and two NCIS agents entered the cubicle area, whereupon the shooter opened fire on them, hitting one of the officers, Scott Williams, in both legs. The other officer and the NCIS agents dragged Williams out of the area and alerted other officers to the shooter's presence. Williams was later taken down to the first floor for medical attention, recovering from his wounds. At 9:15 a.m., soon after Williams' evacuation, D.C. Police Emergency Response Team officer Dorian DeSantis and U.S. Park Police officers Andrew Wong and Carl Hiott entered the cubicle area and searched the individual banks. Eventually, the shooter jumped out from one of the desks and fired at DeSantis from approximately five feet away, hitting him once in his tactical vest, and the three officers returned fire. DeSantis was uninjured by the gunshot. At 9:25 a.m., the shooter was fatally shot in the head by DeSantis, and his death was later confirmed at 11:50 a.m. There were 13 fatalities, including the perpetrator. The shooter and 11 of the victims were killed at the scene, while a twelfth victim, 61-year-old Vishnu Pandit, died at George Washington University Hospital. All the victims killed were civilian employees or contractors. Eight others were injured, three of them from gunfire. The survivors wounded by gunshots (police officer Scott Williams and two female civilians) were in critical condition at Washington Hospital Center. CCTV video of Alexis in the Navy Yard. Aaron Alexis (May 9, 1979 – September 16, 2013), a 34-year-old civilian contractor, was identified by police as the sole gunman. Alexis was killed in a gunfight with police. Born in the New York City borough of Queens, Alexis grew up in Brooklyn and was a resident of Fort Worth, Texas. He joined the United States Navy in May 2007, and served in Fleet Logistics Support Squadron 46 at Naval Air Station Joint Reserve Base Fort Worth. His rating was aviation electrician's mate and he had attained the rank of petty officer third class when he was honorably discharged from the Navy on January 31, 2011, although the Navy originally intended for him to receive a general discharge. According to a Navy official, Alexis was cited on at least eight occasions for misconduct. In 2010, he was arrested in Fort Worth for discharging a weapon within city limits. Alexis was also arrested in 2004 in Seattle, Washington for malicious mischief, after shooting out the tires of another man's vehicle in what he later described as the result of an anger-fueled "blackout"; and in 2008 in DeKalb County, Georgia for disorderly conduct. None of Alexis's arrests led to prosecution. In March 2008, Alexis received a secret-level security clearance valid for ten years. Following the Navy Yard shooting, it was found that the federal personnel report that led to the clearance's approval did not mention that his 2004 arrest had involved a firearm. On his clearance application, Alexis said he had never been charged with a felony, and that he had not been arrested in the last seven years; the personnel report said Alexis had given these answers because the 2004 charge had been dismissed. This security clearance investigation was conducted by USIS, the same contractor that had also vetted Edward Snowden. The Department of Justice has filed fraud charges against USIS in a whistleblower case that is filed as United States of America ex rel. Blake Percival vs USIS. From September 2012 to January 2013, Alexis worked in Japan, "refreshing computer systems" on the Navy Marine Corps Intranet network for an HP Enterprise Services subcontracting company called The Experts. [clarification needed] After returning from Japan, he expressed frustration to a former roommate that he felt he had not been paid properly for the work he performed. Another roommate of Alexis said that he would frequently complain about being the victim of discrimination. In July 2013, he resumed working for The Experts in the United States. At the time of his death, Alexis was working on a bachelor's degree in aeronautics from Embry–Riddle Aeronautical University, Worldwide. He was Buddhist. After the Navy Yard shooting, the media speculated that Alexis had appeared to be suffering from mental illness. The media reported that Alexis had filed a police report in Rhode Island on August 2, 2013, in which he claimed to be the victim of harassment and that he was hearing voices in his head. According to an FBI official after the shooting, Alexis was under the "belief that he was being controlled or influenced by extremely low frequency electromagnetic waves". A message later obtained by federal authorities from Alexis's personal computing devices said, "Ultra low frequency attack is what I've been subject to for the last 3 months. And to be perfectly honest, that is what has driven me to this." On August 4, 2013, naval police were called to Alexis's hotel at Naval Station Newport and found that he had "taken apart his bed, believing someone was hiding under it, and observed that Alexis had taped a microphone to the ceiling to record the voices of people that were following him". At the time of the incident, he was working for the contractor at the base. On August 23, 2013, Alexis showed up at a Providence, Rhode Island VA emergency room complaining of insomnia, and he was prescribed 50 milligrams of trazodone, a serotonin antagonist and reuptake inhibitor antidepressant. On August 28, he sought treatment for insomnia in the emergency room of a VA medical center in Washington, D.C. where he told doctors he was not depressed and was not thinking of harming others. He was given 10 more tablets of trazodone. At the time of the shooting, Alexis had been working for a subcontractor on a Hewlett-Packard Enterprise Services contract supporting a Navy Marine Corps (NMCI) computer network. Alexis arrived in the Washington, D.C., area on or around August 25, 2013, and stayed at various hotels. At the time of the massacre, he had been staying with five other civilian contractors at a Residence Inn hotel in southwest Washington D.C. since September 7. On Saturday, September 14, two days before the massacre, Alexis visited the Sharpshooters Small Arms Range in Lorton, Virginia, 15 miles (24 km) south of Washington. He tested an AR-15 semiautomatic rifle but did not seek to buy it, a lawyer for the store said. After testing the rifle, Alexis inquired about buying a handgun at the store, but was told federal law does not allow dealers to sell such guns directly to out-of-state customers. Alexis instead purchased a Remington 870 Express Tactical 12-gauge shotgun and two boxes of shells, after passing a state and federal background check. Before the shooting, Alexis sawed off the shotgun and scratched the phrases "Better off this way! ", "My ELF weapon! ", "Not what yall say! ", and "End to the torment!" onto the gun's receiver. Defense Secretary Chuck Hagel and others lay a wreath at the Navy Memorial on September 17 in honor of the victims. On the day of the shooting, Washington Chief of Police Cathy L. Lanier initially said that police were searching for a white male wearing khaki military fatigues and a beret, who had allegedly been seen with a handgun, and a black male wearing olive military fatigues and carrying a long gun. The white male was later identified and deemed not to be a suspect. The black male was not identified. At 7:00 p.m., officials ruled out the possibility of other shooters, but were still seeking one other person for possible involvement. On September 16, many roadways and bridges were temporarily closed, and flights out of Ronald Reagan Washington National Airport were temporarily suspended. Eight schools were locked down, with the closest, Brent Elementary School, being locked down until 1 PM. Shortly after 3:00 p.m., United States Senate buildings went on lock-down for about an hour "out of an abundance of caution", according to the Senate Sergeant at Arms. The Washington Nationals baseball team postponed their scheduled evening game, owing to the proximity of Nationals Park to the Navy Yard area (the facilities are close enough to share a Metro station). The Navy Yard reopened and resumed usual operations on September 19, 2013. Building 197 reopened on February 2, 2015. In October 2013, the Navy announced a repair-and-restoration contract for the building; the contract indicated that "the repairs shall be done in a manner that changes the feel, finish, appearance and layout of the space, creating a different sense of place and mitigating the psychological and emotional impacts that the facility itself could have on returning occupants". The building, renamed after Joshua Humphreys, reopened in 2015. The renovations, costing approximately $44 million, include a reflection area and new visitors' entrance, new flooring and furnishings and an updated cafeteria. President Obama receives an update on the shootings investigation from ex-FBI Director James Comey, left, and Attorney General Eric Holder in the Oval Office on September 17, 2013. Shortly after news of the shooting broke, United States President Barack Obama pledged to ensure the perpetrators would be held responsible. Obama ordered flags at the White House, all public buildings and all military and naval posts, stations and vessels to be flown at half-staff until sunset on September 20. On September 17, Department of Defense officials laid a wreath at the Navy Memorial plaza in honor of the victims. In the wake of the shooting, President Obama called on Congress to revisit gun control legislation. On September 22, he attended a memorial service for the victims. The shooting sparked a discussion on the adequacy of security at U.S. military facilities. On September 18, Defense Secretary Chuck Hagel ordered a review of security procedures at military facilities around the world. Foreign Policy magazine reported that virtually anyone with a Common Access Card (C.A.C. ), provided to government contractors, civilian Defense Department employees, and soldiers, can enter many military facilities "without being patted down or made to go through a metal detector". The shooter had a Secret-level security clearance and a C.A.C. allowing him to enter the Navy Yard. Conservative commentators including Alex Jones, Ted Nugent, and others suggested that "gun-free zones" on military bases were to blame for the massacre. On NBC's Meet the Press, National Rifle Association leader Wayne LaPierre said, "when the good guys with guns got there, it stopped." In the libertarian Reason magazine, J.D. Tuccille said that on domestic U.S. military bases, most soldiers are prohibited from carrying guns, and that this made the base more vulnerable to an attack. On September 17, gun control activists and relatives of victims of shootings that occurred at Sandy Hook Elementary School; Aurora, Colorado; and the Oak Creek, Wisconsin Sikh temple, came to Washington to protest for stricter gun control. The activists said they hoped that the Navy Yard attack's proximity to Capitol Hill would motivate lawmakers to act to impose stricter background checks and close the gun show loophole. On September 25, 2013, Hewlett Packard fired the computer firm The Experts, which employed the shooter, over "its failure to respond appropriately" to the Washington Navy Yard shooter's mental health issues. On October 31 and December 17, 2013, the Senate's Committee on Homeland Security and Governmental Affairs held hearings examining government clearances, background checks, and physical security for federal facilities in the wake of the shootings. On February 20, 2014, a ceremony was held to honor the over 170 law enforcement officers, including 57 D.C. Metropolitan Police officers, who responded and entered the building to search for the shooter. Specifically, MPD Officers Scott Williams and Dorian DeSantis were given the Medal of Valor, U.S. Park Police Medal of Honor, and the Blue Badge Medal for their roles during the gun battle. On December 19, 2014, President Obama signed a bill authorizing the establishment of a memorial to the shooting. A remembrance wall was dedicated the following February. ^ Miller, S.A.; Sheehy, Kate; Celona, Larry (September 16, 2013). "DC massacre gunman named – had ex-Navy Yard staffer's ID". New York Post. ^ a b c d e f g h i j k "Rampage at the Navy Yard: What happened inside Building 197?". The Washington Post. September 20, 2013. Retrieved September 23, 2013. ^ "FBI releases terrifying footage of the Navy Yard shooter". The Week. Retrieved May 17, 2018. ^ Solomon, John (September 16, 2013). "Aaron Alexis may have picked up and used victims' weapons: investigators". The Washington Times. Retrieved September 23, 2013. ^ a b c d e Shear, Michael D.; Schmidt, Michael S. (September 16, 2013). "Gunman and 12 Victims Killed in Shooting at D.C. Navy Yard". The New York Times. Retrieved September 23, 2013. ^ a b c d "12 Victims Killed, 8 Wounded in Shooting at D.C. Navy Yard, Suspected Gunman Killed". NBC Washington. September 17, 2013. Retrieved September 23, 2013. ^ a b Morello, Carol; Hermann, Peter; Williams, Clarence (September 16, 2013). "Authorities identify seven of the 12 people killed in Navy Yard shooting". The Washington Post. Retrieved September 23, 2013. ^ "FBI: Navy Yard shooter 'delusional,' said 'low frequency attacks' drove him to kill". CNN. September 25, 2013. Retrieved October 19, 2014. ^ a b c d e Paul Wagner (September 25, 2013). "Photos and video of Navy Yard Shooting released by FBI". Retrieved October 19, 2014. ^ a b c d e f g h i j k l m n "Navy Yard shooting: D.C. police after-action report". Metropolitan Police Department of the District of Columbia. July 11, 2014. ^ "Navy Yard shooting: Up to speed in 3 minutes". CNN. September 20, 2013. Archived from the original on September 21, 2013. Retrieved September 19, 2013. ^ a b c d "Navy Yard Shooting Timeline". The Huffington Post. September 17, 2013. Retrieved October 19, 2014. ^ "Thirteen killed in US Navy base shooting". Al Jazeera. September 16, 2013. ^ "Report: Capitol Police thwarted from aiding at Navy Yard". Retrieved September 17, 2018. ^ a b c "DC gunman was suffering host of mental issues prior to shooting, report says". Fox News. September 17, 2013. Retrieved September 23, 2013. ^ "Aaron the shooter easily passed two background checks, bought shotgun from Sharpshooters in Lorton, Va". The Washington Times. Retrieved September 17, 2013. ^ a b c d Williams, Clarence (February 21, 2014). "D.C. police honor courage, dedication of Navy Yard massacre responders". Washington Post. ^ Yan, Holly; Duke, Alan (September 22, 2013). "Who were the victims of the Navy Yard shooting?". CNN. Retrieved September 23, 2013. ^ "Indian Contractor Vishnu Pandit killed in Washington Navy Yard Shooting". Bihar Prabha. September 17, 2013. Retrieved September 23, 2013. ^ a b "13 killed in Washington Navy Yard shooting rampage". Associated Press via Yahoo News. September 17, 2013. ^ a b "'One of the worst things we've seen' - a timeline of Navy Yard shooting". CNN. September 16, 2013. Retrieved October 19, 2014. ^ Morello, Carol; Hermann, Peter; Joseph, Clarence Williams (September 16, 2013). "At least 13 dead in Navy Yard shooting, 14 injured". The Washington Post. Retrieved September 16, 2013. ^ "'I felt him breathe': Survivor of Washington Navy Yard shooting talks about trying to save life of Vishnu Pandit, a co-worker killed during massacre". NY Daily News. Retrieved October 19, 2014. ^ a b Mutzabaugh, Ben (September 16, 2013). "D.C. departures resume after Navy Yard shooting". USA Today. Retrieved September 16, 2013. ^ a b c Starr, Barbara; Shoichet, Catherine E. (September 16, 2013). "'Multiple' deaths in Navy Yard shooting rampage; suspects may be on loose". CNN. Retrieved September 16, 2013. ^ a b Das, Arun Kirstian (September 16, 2013). "Who is Aaron Alexis?". MY Fox NY. ^ Ginger Adams Otis (September 16, 2013). "Washington gunman hails from New York, where he's recalled as 'sweet,' 'peaceful'". Daily News. ^ Jim Miklaszrewski; Pete Williams; Richard Esposito; Erin McClam (September 16, 2013). "At least 12 killed in shooting rampage at Washington Navy Yard, chief says". NBC News. ^ "Officials: At Least 1 Shooter Dead at Navy Yard". Associated Press. Retrieved September 16, 2013. ^ Nina Strochlic (September 16, 2013). "Up to Speed: What We Know About Navy Yard Shooter Aaron Alexis". thedailybeast.com. ^ a b Kevin Johnson; Rick Jervis; Richard Wolf (September 16, 2013). "Aaron Alexis, Navy Yard shooting suspect: Who is he?". USA Today. ^ Mariano Castillo; Chelsea J. Carter (September 17, 2013). "2008 arrest led to Washington Navy Yard shooter Aaron Alexis' Navy discharge". CNN. ^ "More on Aaron Alexis's time in the Navy". The Washington Post. Retrieved September 17, 2013. 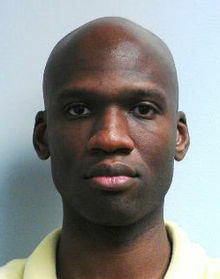 ^ "Aaron Alexis identified as Washington Navy Yard shooter". BaltimoreNewsJournal.com. Retrieved September 16, 2013. ^ Frank Heinz (September 16, 2013). "Aaron Alexis' Fort Worth Arrest Report". NBC DFW News. ^ John de Leon (September 16, 2013). "SPD: Navy Yard shooter arrested in Seattle in 2004 for shooting". The Seattle Times. ^ Crary, David. "Gunman in Navy Yard shooting was in Navy Reserves". San Francisco Chronicle. Retrieved September 16, 2013. ^ Theresa Vargas; Steve Hendrix; Marc Fisher (September 17, 2013). "Aaron Alexis, 34, is dead gunman in Navy Yard shooting, authorities say". The Washington Post. Retrieved September 16, 2013. ^ Weiss, Murray; Fractenberg, Ben (September 17, 2013). "Aaron Alexis, New York Native And Alleged DC Gunman, Once Had Rifle Permit From NYPD". Huffington Post. Retrieved September 17, 2013. ^ "Navy Yard shooter's personnel report left out gun-related details". Los Angeles Times. Retrieved October 19, 2014. ^ Sakthi Prasad (January 23, 2014). "U.S. brings fraud charges against firm that vetted Snowden". Retrieved April 4, 2014. ^ Jack Moore (May 8, 2014). "Background investigation fraud case against USIS moved to DC court". Retrieved May 16, 2014. ^ Campoy, Ana (September 16, 2013). "Friend Says Alexis Was Videogame Fan, Heavy Drinker". The Wall Street Journal. Retrieved September 17, 2013. ^ "Aaron Alexis, gunman in D.C. Navy Yard shooting, was 'nice' guy with history of run-ins with police". The Times-Picayune. Associated Press. September 16, 2013. ^ Hennessy-Fiske, Molly; Zucchino, David (September 16, 2013). "Aaron Alexis: An adept Buddhist chanter and an angry man with a gun". Los Angeles Times. ^ "Alleged Gunman Said He Couldn't Sleep In Hotel Due To Noises In His Head". Huffington Post. September 19, 2013. ^ "Friends Describe Navy Yard Gunman as 'Very Polite' Buddhist Who Loved to Meditate". Mediaite. Retrieved September 17, 2013. ^ Eric Tucker 18 September 2013. Aaron Alexis, Navy Yard Shooting Suspect, Thought People Followed Him With Microwave Machine. The Huffington Post. Retrieved: 22 September 2013. ^ Greg Botelho and Joe Sterling. September 26, 2013. FBI: Navy Yard shooter 'delusional,' said 'low frequency attacks' drove him to kill. CNN. Retrieved: 26 September 2013. ^ Tom Vanden Brook, USA TODAY (March 18, 2014). "Report: Concerns about Navy Yard shooter never reported". Retrieved October 19, 2014. ^ "Aaron Alexis, Navy Yard shooter, fooled Veterans Affairs doctors". WJLA. Retrieved October 19, 2014. ^ Steve Vogel, Sari Horwitz and David A. Fahrenthold. 19 September 2013. Navy Yard gunman Aaron Alexis told VA doctors he was not thinking of harming others. The Washington Post. Retrieved: 19 September 2013. ^ Wolfgang, Ben (September 17, 2013). "FBI: Alexis acted alone, had only one weapon, arrived in D.C. 3 weeks ago". The Washington Times. Retrieved September 23, 2013. ^ Jackman, Tom (September 18, 2013). "Inside Sharpshooters, the Newington gun store where Aaron Alexis bought his shotgun". The Washington Post. Retrieved September 23, 2013. ^ Miller, Emily (September 17, 2013). "MILLER: New York Times gets it wrong, media obsessed with linking AR-15 with Navy Yard shooter". The Washington Times. Retrieved September 23, 2013. ^ Miller, Emily (September 20, 2013). "MILLER: New York Times corrects AR-15 Navy Yard story, still misses the mark". The Washington Times. Retrieved September 23, 2013. ^ Mitchell, Greg (September 20, 2013). "'NYT' Corrects D.C. Shooter/AR-15 Story—But Key Claim Remains". The Nation. Retrieved September 23, 2013. ^ Christopher, Tommy (September 18, 2013). "Report: Navy Yard Shooter Aaron Alexis Test-Fired AR-15, State Law Prevented Purchase". Mediaite. Retrieved September 23, 2013. ^ Asseo, Laurie; Lerman, David (September 25, 2013). "Washington Navy Yard shooter believed he was controlled by electromagnetic waves, FBI says as new images released". National Post. Retrieved August 21, 2016. ^ Moody, Chris; Stableford, Dylan. "At least 10 wounded in Washington Navy Yard shooting; multiple fatalities". Yahoo News. Retrieved September 16, 2013. ^ Gabbatt, Adam (September 16, 2013). "Washington DC shooting: Aaron Alexis named as navy yard gunman – as it happened". The Guardian. Retrieved September 23, 2013. ^ a b Carol Morello, Peter Hermann & Clarence Williams (September 16, 2013). "At least 13 dead in Navy Yard shooting; possible suspect at large". The Washington Post. ^ Simon, Richard; Cloud, David S.; Bennett, Brian (September 16, 2013). "Navy Yard shooter 'had a pattern of misconduct'". Los Angeles Times. Retrieved September 23, 2013. ^ Stephen Dinan (September 16, 2013). "Senate lockdown lifted". The Washington Times. Retrieved September 16, 2013. ^ Kilgore, Adam; James Wagner (September 16, 2013). "Nationals-Braves game canceled after Navy Yard shootings (updated)". The Washington Post. Retrieved September 16, 2013. ^ Kilgore, Matthew; Stabley (September 19, 2013). "At the Navy Yard, workers returned Monday to the scene of a rampage that killed 12". NBC Washington. Retrieved September 19, 2013. ^ "Navy Yard Building 197 may be renovated, no final decision yet". WJLA. Associated Press. October 4, 2013. Retrieved January 16, 2014. ^ Associated Press. "Navy Yard Shooting: Building 197 will be renamed before reopening". WJLA.com. Retrieved May 29, 2014. ^ "President Obama: 'Cowardly Act' at Navy Yard". ABC News. September 16, 2013. ^ Reilly, Mollie (September 16, 2013). "Obama: Flags To Be Flown At Half-Staff In Wake Of Navy Yard Shooting". Huffington Post. Retrieved September 17, 2013. ^ "Navy Yard gunman kills 12; dead shooter was contractor". CNN. September 18, 2013. Retrieved September 17, 2013. ^ Rucker, Philip (September 17, 2013). "Obama calls for gun control in wake of Navy Yard shooting". Washington Post. Retrieved October 20, 2015. ^ "Obama to attend memorial service for Navy Yard shooting victims". The Washington Times. Retrieved September 18, 2013. ^ Fritze, John; Matthew Hay Brown (September 16, 2013). "Navy Yard shooting reopens debate on base security". The Baltimore Sun. Retrieved September 17, 2013. ^ "Hagel orders review of security procedures after Navy Yard massacre". The Washington Times. Retrieved September 18, 2013. ^ Dreazen, Yochi (September 16, 2013). "Navy Yard Shooting Highlights Military's Security Flaws". Foreign Policy. Retrieved September 17, 2013. ^ "Aaron Alexis Had 'Secret Clearance,' Employer Says About Washington Navy Yard Suspect". Huffington Post. Reuters. September 16, 2013. Retrieved September 17, 2013. ^ "The Growing Myth Of Mass Shootings And "Gun-Free Zones"". Media Matters for America. September 17, 2013. ^ "Colo., Conn. Gun Activists Go to DC After Shooting". Associated Press. September 17, 2013. Retrieved September 21, 2013. ^ "HP fires contracting firm who employed Navy Yard gunman". NBC News. Retrieved September 26, 2013. ^ "The Navy Yard Tragedy: Hearing Before the Committee on Homeland Security and Governmental Affairs, United States Senate, One Hundred Thirteenth Congress, First Session: Examining Government Clearances and Background Checks, October 31, 2013; Examining Physical Security For Federal Facilities, December 17, 2013". ^ "Carl Levin and Howard P. "Buck" McKeon National Defense Authorization Act for Fiscal Year 2015". uscode.house.gov. Retrieved March 26, 2019. ^ Brown, DeNeen. "Remembrance wall dedicated to 12 victims of Navy Yard shooting". Washington Post. Mass shootings in Washington, D.C. This page was last edited on 20 April 2019, at 02:21 (UTC).